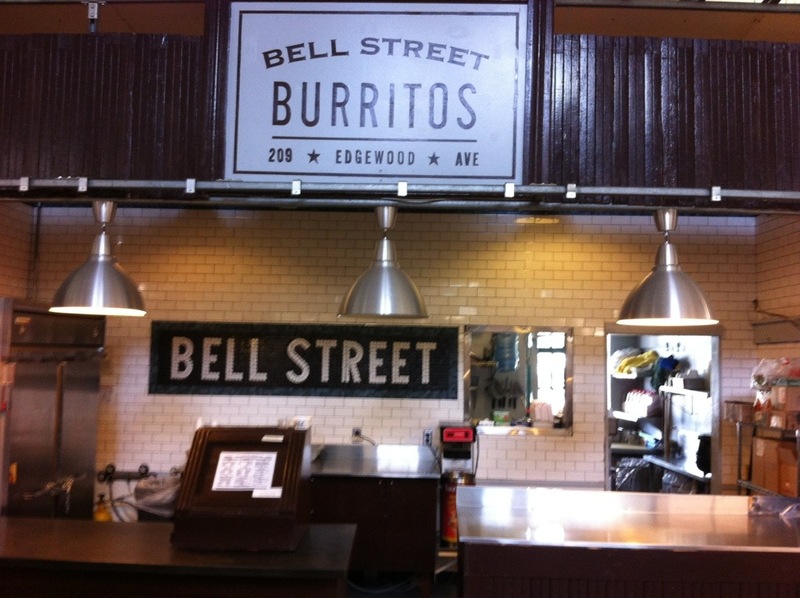 After first hearing about Bell Street Burritos in Atlanta Magazine (back in the March, 2012 “Cheap Eats” edition), I’ve been meaning to get by there. They had opened a location on Howell Mill, which I believed would surely be easier to get to than the Sweet Auburn Curb Market. But it closed without me ever making there. Today is the day that we finally give it a try. 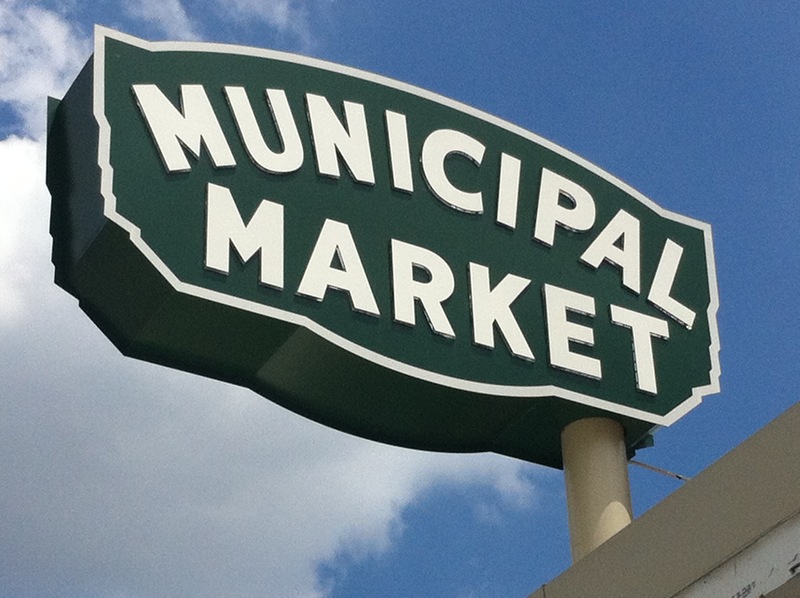 It had been several years since my last visit to the “Municipal Market”, so we drove through the miserable construction on Edgewood and Jesse Hill, entered the pay parking lot (if you spend $5.00 or more inside and the vendor will validate an hour of parking), found a great parking spot and bounced inside. When we arrived, this is what we found – a counter with not a soul behind it. I swore that I looked on-line and saw that they were open on Saturdays. I pulled the website up on my phone and saw that the hours were posted separately for the two locations. Two locations? I thought the Howell Mill location closed? It did. They’ve opened another in the Old 4th Ward on Irwin. I had read the menu wrong and looked at the hours for that location. This attempt was foiled. a relatively new entrant to the Atlanta food scene, with a store-front (notice the good-looking man ordering above), a food truck and a catering operation. 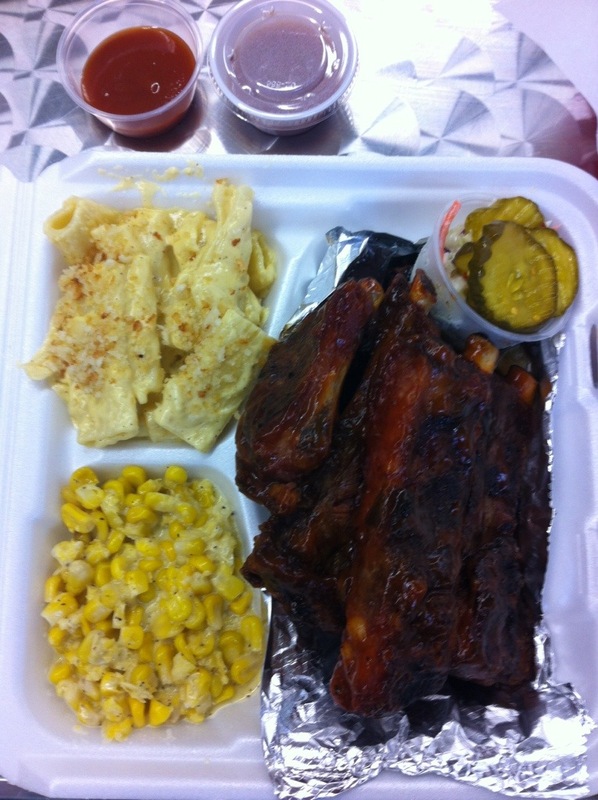 They offer beef, pork chicken and ribs and a broad assortment of sides, as sandwiches, plates and even tacos. Not listening to my own advice to ALWAYS start with the pork, I ordered a smoked fried rib combo with mac and cheese and creamed corn. The creamed corn and mac and cheese were both in desperate need of seasoning – each was fairly bland. FWIW – the pickle cup in the corner has a bit of their slaw underneath and the meal was also served with a slice of Texas toast. 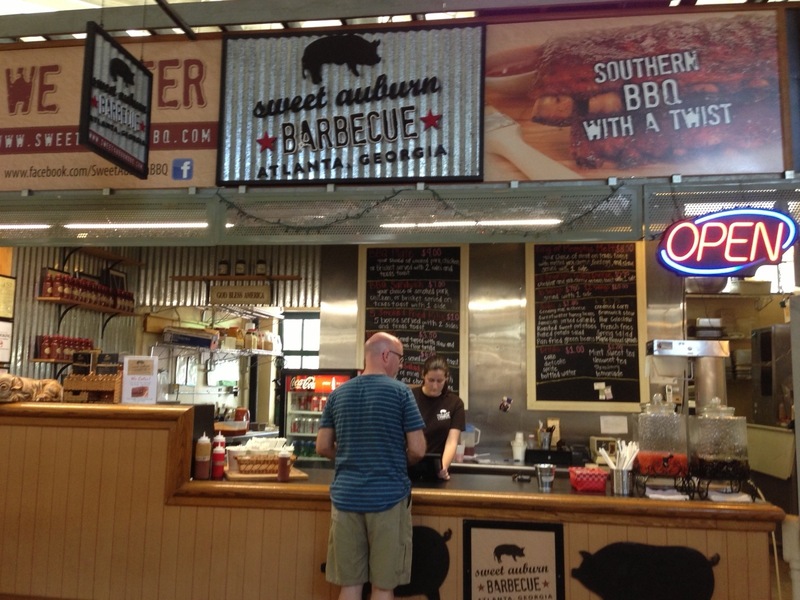 They offer two barbecue sauces – a St Louis style that they had just made up when I arrived (the bottle was hot to the touch) and a sweet and spicy sauce that I really enjoyed the taste of. They didn’t offer ribs in any form except for the smoked then fried ribs. 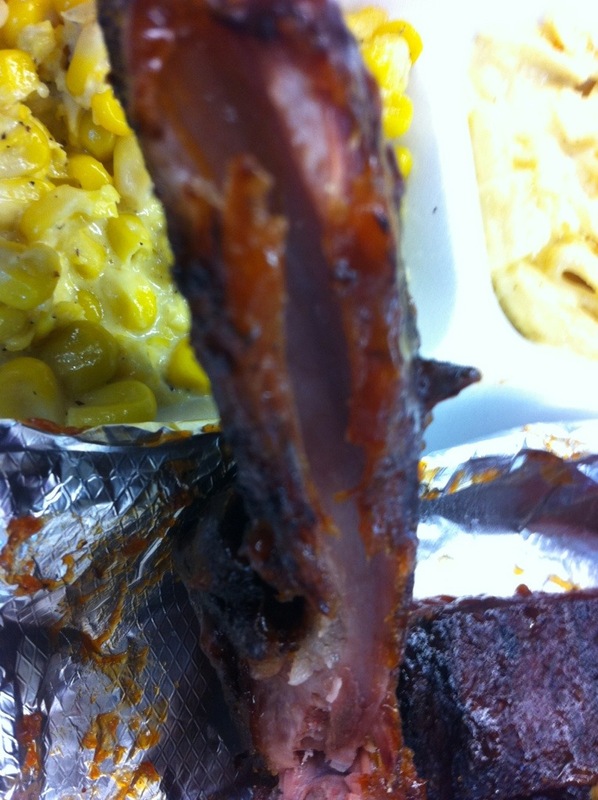 The rib, underneath the fried crust, pulled of the bone perfectly, was very smoky and tasted good. I think that I would have preferred a non-fried version as the fried edges left a slightly hard crust. 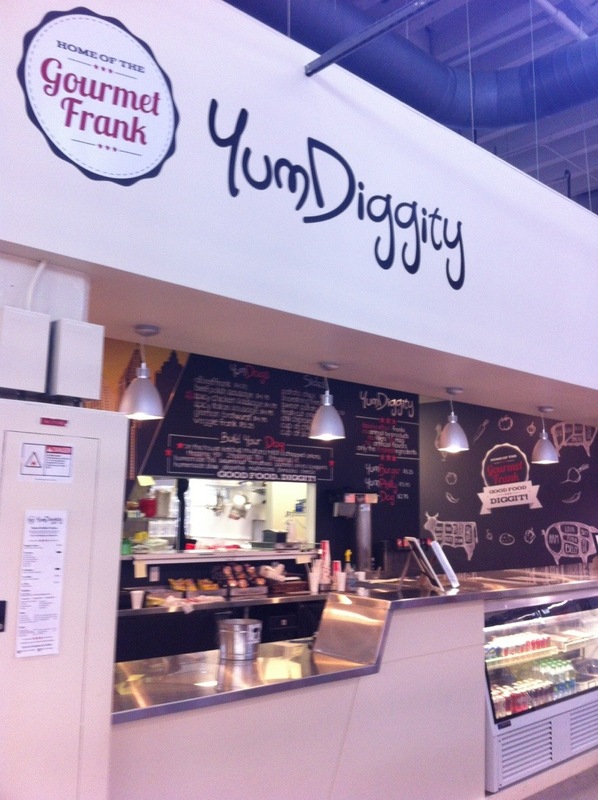 While I was deciding on what to eat, we passed by YumDiggity. I didn’t know when we would be back, so how could I try YumDiggity? The folks behind the counter were eager to tell us about their all natural meats and casings and Jo said that she’d split a dog with me. I ordered us a spicy chicken sausage dog with chili and cheese. 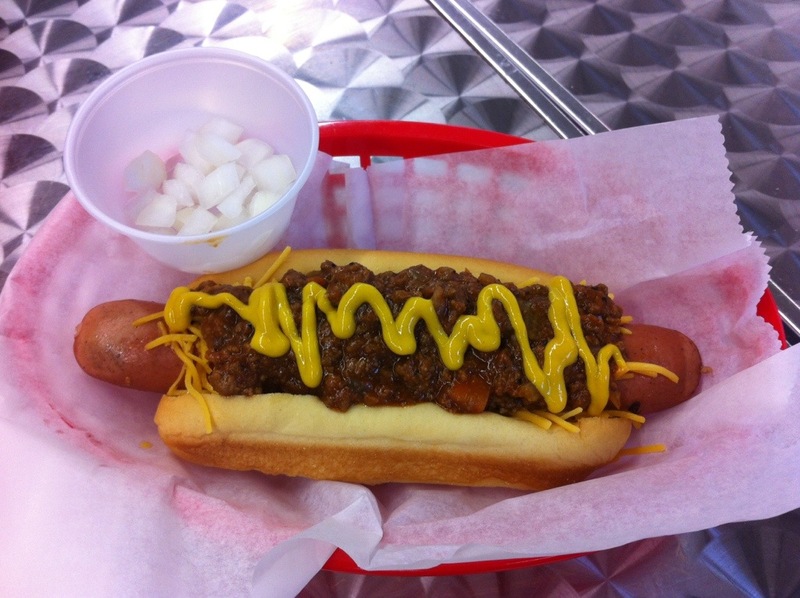 I received raised eyebrows from my mate, and quickly changed the order to an all beef frank with the chili and cheese. When they called my name, we picked up this good sized dog. I asked for the onions on the side (for Jo’s half) and added the mustard myself. It wasn’t particularly good – nothing that I would try again. The dog was oddly sweet and the chili had carrots in it. We finished about half of each of our halves. For her lunch, Jo went with a tried and true turkey burger with onion rings from Grindhouse Killer Burgers (which was likely the reason for our last visit to the market, some time in late 2010). 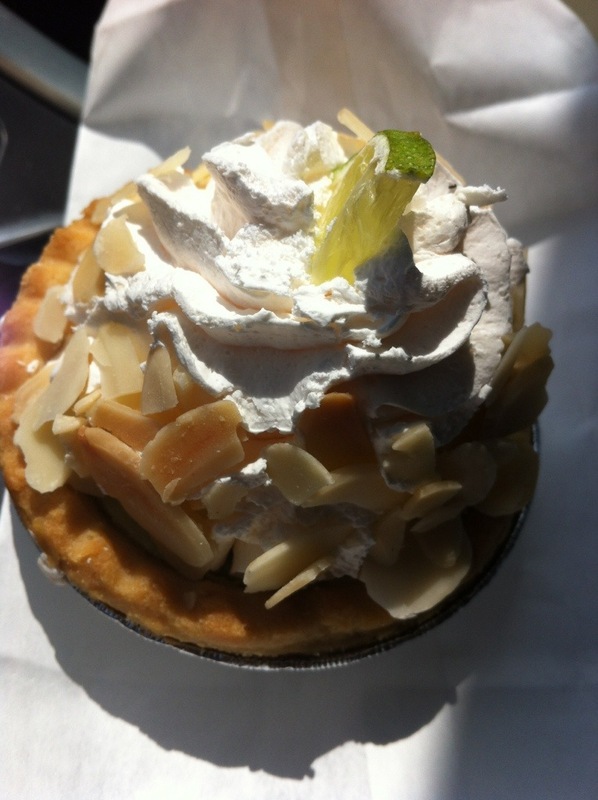 As we left the market, I picked up a key lime tart from the bakery for later, looking forward to a snack later in the afternoon. About two hours later, before we ran into a store, I scraped the whipped cream and nuts off the top of the tart into the bag and ate the tart. It was okay, but nothing particularly grand. I guess I’ll have to get by there one weekday (between 11:00 and 3:00 if I want a burrito from there).